So the French, Italians, and Spanish sometimes positioned pavisiers in front of formations of crossbowmen to defend against enemy fire. This is also how I imagine the Scottish used their "aixmen". 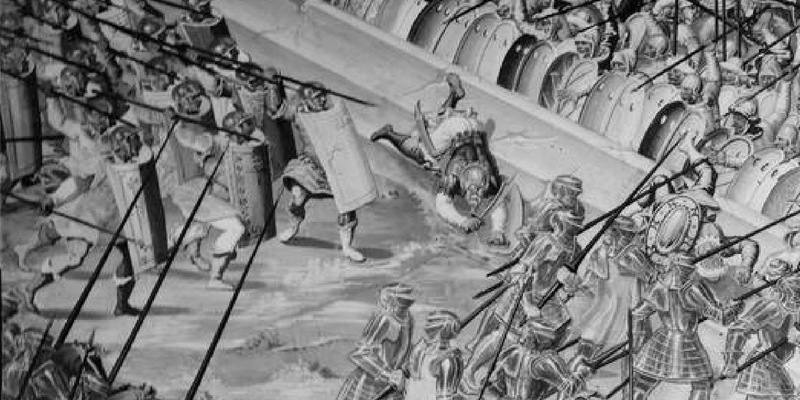 I wonder; If an enemy forced advanced on the crossbowmen's position, would these pavisiers fight with spear and shield like in earlier shieldwalls, or would they discard their pavises so as to wield their spears in both hands? As it would be impractical to wield a pavise with a pollaxe, I imagine that Scottish axe-men (assuming that my theory is correct) would abandon their targes if and when they needed to use their axes or brogit staves. Pedro I have seen this "Adoration of the Magi" painting before, and considered bringing it up in this discussion, but I chose not to so as not to steer the conversation away from pavises. I intended to make another thread to discuss this very subject but never got around to it. When I get some time, perhaps later on this evening, I'll give my thoughts on these unusual shields. So the French, Italians, and Spanish sometimes positioned pavisiers in front of formations of crossbowmen to defend against enemy fire. I would like to add the description of the metaphorical battle of the meat against the feast, before lent, as described in the Castilian "Libro del buen amor" (1330, with additions in 1343): shielded spearmen (with "frontline man spears") in front of the crossbowmen. fazían su alarde çerca de los tisones. en la buena yantar éstos venían primero. luego en pos aquéstos están los caballeros. Before I talk about the adoration of the magi painting, I'll say one quick thing about the use of the some words related to targe. In German speaking countries the word tartsche (obviously a borrowing from targe) is a synonym for schild (shield), though usually it is used to describe rectangular shields. For example a German term for pavise is setztartsche (a shield that you set up), and a hand pavise is a handtarsche (no explanation needed here). And of course in Italy there was a rectangular shaped buckler called a targa, which looks like a smaller version of a hand praise. This could possibly strengthen the idea that 15th century Scottish targes were also rectangular. Anyway getting back to the shields from the adoration of the magi painting. Let's list the things that we know for certain about the targes from the 15th century legislations and see if the shields in the painting match. 1. It was a new or unusual design of shield that many would have been unfamiliar with, thus necessitating example being sent out to each shire. 2. It was primarily intended to defend against English arrows. 3. It was cheap; no more than the value of a hide. 4. It was made from either leather or from wood. 5. It had two handles on the back. It isn't definite but William Patten may have been talking about these same targes when he said; "They were new boards' ends cut off, being about a foot in breadth and half a yard in length : having on the inside, handles made very cunningly of two cords". So do the shields depicted in the painting of the adoration of the Magi adhere to these criteria? Due to the angle from which they are painted it's hard to make out their exact size and shape. We also don't know what they are made from or what sort of grip they were used with. They seem to be about the right size if we accept Patten's description, but on the other hand this means that they are fairly small and of limited use for protecting against English arrows. Neither Patten nor the legislations mention a metal boss, and this would make them more than the value of a hide. Overall I'm not sure what to make of these shields. So the French, Italians, and Spanish sometimes positioned pavisiers in front of formations of crossbowmen to defend against enemy fire. This is also how I imagine the Scottish used their "aixmen". We have evidence of it being used thus by the Spaniards and the Italians, but I have not yet come to find anything explicit of the French doing so in pitched battles. That is to say, it is extremely probable that actually did too, for we have illustrations of that in sieges. Both of them represent italian pavesare's but you can see the second link is showing much smaller shields, so there isn't exactly something linear in the size of their shields. I'm not so good at spanish, Iagoba can tell best, but they are basically describing what I'm saying. The source I posted above also tells about how much pavisiers would be generally seen in armies of small contingents, before they faded out of existence by 1510's, as spanish infantry adopted the swiss equipment (the portuguese were slower in these). In the poetry posted above, the last verses describes knights behind the pavisiers ("luego en pos aquéstos están los caballeros" = shortly after then [i.e. the pavisier and the crossbowmen] there were the knights). The 1385-1390 castillian ordinance of arms and armor tells us about shield, but doesn't mention their size (file below). I wonder; If an enemy forced advanced on the crossbowmen's position, would these pavisiers fight with spear and shield like in earlier shieldwalls, or would they discard their pavises so as to wield their spears in both hands? As it would be impractical to wield a pavise with a pollaxe, I imagine that Scottish axe-men (assuming that my theory is correct) would abandon their targes if and when they needed to use their axes or brogit staves. Not exactly the roman testudo or the germanic shieldwall, but somehow a shield-line. In the illustrations of Higueruela, they were always with their shields. If they were forced to meéle fighting, they would use their spears or their swords. I don't believe discarting a pavise in a battle would be wise (not to mention its price), so I would rather think their axes were single handed ones (the two handed being used without shield). Great stuff Pedro. I never really thought of these infantrymen with large oval shields as pavisiers before, but I suppose they are, or at the very least they seem to perform the same function. I have to beg to differ on the issue of whether Scottish axe-men were using one or two handed axes. At least one of the legislations mention that axes can be substituted for brogit staves or short spears, and as these two weapons are poleaems I have to think that so were the axes. All the legislations which mention axe-men between 1430 and 1491, list their minimum equipment as; helmet, jack, axe, sword, and either a buckler or a targe. If you already have a sword as a sidearm, why would you want a single handed axe as your primary weapon? Wouldn't a two handed axe make more sense in this scenario? Also the adoration of the magi painting shows men armed with glaives and medium sized shields. A glaive is a two handed weapon so I'm really not sure how it was used in conjunction with a shield. The only thing that I can think of is that the shield was left hanging from a strap around the neck leaving both arms free to wield the glaive. Perhaps this is also how Scottish axe-men used their shields? The downside of using a shield like this is that is could potentially limit some of the pollaxe techniques which could otherwise be used. Thing is: there examples of pavises made out of several wooden boards, each next to the other, instead of a single piece of wood? With the exemption of the mantlets (also called "pavises"), I don't know if we have such examples (but I'm likely to agree the targes in Patten's description were indeed mantlets, due to how the english used their cannons to destroy them). All pavises I know were also fully made of wood and painted. Regarding the picture, I think this disposition of glaive+shield has to do with the ceremonial occasion here, rather than those actually being used for fighting. Reasonable, but the axe can deliver more energy than a sword (Machiavelli says the pikeman's arming sword is pretty useless against an armored opponent). Considering axes as not so redundant for one who already has a sword, the idea of axe+targe main combination was perhaps intended to be more effective (and axes could sometimes break or split of its head) than sword+targe. My main problem with the suggestion of those axes actually being two-handed is because it would be such a waste of money to simply throw off a pavise when you had to fight at close range. 2. Perhaps I'm making an immeasurably wild stretch here, but could the axes refer to something a lot larger? Like short halberds or the like? James. It is entirely possible that the axes mentioned in these legislations referred to halberds or Lochaber axes or any number of axe-like polearm. My money however is on it meaning Pollaxe. Personally i think that a shield strapped to your arm would get in the way while trying to wield a polearm, but I could be wrong. For what its worth the famous painting of the Battle of Culloden does depict one of the charging Highlanders as using a Lochaber axe in two hands while having a targe strapped to his arm. Pedro. If they wanted a single handed weapon to better deal with armour then a mace or warhammer would have been a better choice than an axe IMO. I don't think that a single handed axe would be any better than a sword for dealing with an armoured opponent. My main problem with the suggestion of those axes actually being two-handed is because it would be such a waste of money to simply throw off a pavise when you had to fight at close range. Well the legislation does specify that these "targes" be no more than the value of a hide, so perhaps they were thought of as cheap and disposable. Another possibility is that I'm completely wrong about these targes actually being pavises, and they were more like the shields depicted in the adoration of the magi painting. Perhaps the shields were used to protect the un-armoured faces of the axe-men as they approached the enemy, but then just before contact was made, they slung their shields across their backs to free up both hands to wield their axes. 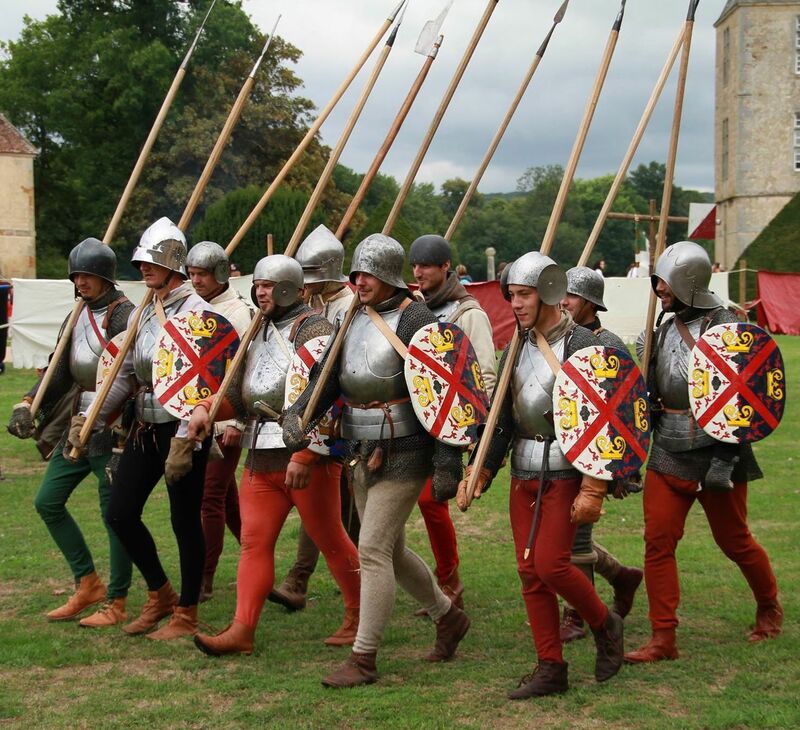 The burgundian pikemen also had their shield in their left arm. Also, I would like to mention that those burgundian shields are mentioned as "targes" in the translations I found, by their profile is oval rather than rectangular. "The pikeman must wear a sleeved jacket reinforced with plates, and a breastplate. His right arm should be protected by more plate armour, and his left arm by a targe (a small round shield). Since he would need both hands free to wield his weapon, the targe may have been fastened to his arm." "The pikeman must wear a sleeved jacket reinforced with plates , and a breastplate. His right arm should be protected by more plate armour, and his left army by a targe (a small round shield). Since he would need both hands free to wield his weapon the targe may have been fastened to his arm. " "The pikemen shall wear a shirt of mail with sleeves and breast, on the right arm on the mail bands of iron with small guards, on the left arm they'll only have the sleeve of the haubergeon, so as to wear more easily the light target they'll recieve when they'll need it." 2- They could, actually. Scots were using two handed axes as just as single-handed ones. But the styles of those shield are rather "traditional" rather than of imported style (like pollaxes), usually "irish axes" or lochamber axes. I'm not saying it's impossible they had pollaxes, it's likely they had it too! But they definitely wouldn't be as popular as the local fashion axes. Maces were fairly of higher prices, and the case of scots is particular because the axe itself is recognized as a national weapon, in the same way as the morningstar and the flail was recognized as the traditional bohemian weapon (in the Book of Emperor Maximilian he's represented carrying a morningstar as a symbolism of his sovereignship over bohemian lands; other weapons were also representative of other principalities as well). The mention of the axe as a traditional scottish weapon isn't limited to the english or even the anglophile Jean Froissart. The latter even saying the scottish were "masters" in some arts of axe-wielding: like picking an axe at your back and handling in fancy motion (he mentions his statement when describes a knight doing such feature in battle); it's likely that King Robert de Bruce also did this feature when he slew an English champion with his axe. I believe axe-throwing pratice was fairly popular too. In any case, regarding efficiency against armoured opponents, the axe it objectively superior to the sword. Not only single-handed axes are mentioned with some efficiency against armoured opponents (again, Robert de Brus slain a fully armoured knight with a single stroke of his axe), but in other parts of Europe cavalrymen had axes as a popular secondary weapon against other armoured soldiers: the "horseman's axe" being the most representative of all. There is a source from another anglo-scottish battle that also says the scots were causing considerable trouble to the English due to their axes strokes (I believe I already posted it in the previous pages). The axe can achieve superiority against the sword because it's movements rely in its momentum (weight of the head x distance of the handle == good momentum), which is basically why hammers and pollaxes were also effective against armor. There were actually swords with better momentum, like falchions, but I believe they can't do much against armor and surely aren't as good as axes at delivering energy (but are objectively better at parrying and more versatile too). Thesis 2: The axes were one handed and the main weapon of the axemen. Such selection was basically because the axe was more effective against armor than the sword. Also, I would like to mention that those burgundian shields are mentioned as "targes" in the translations I found, by their profile is oval rather than rectangular. As far as I'm aware nobody actually know what form these Burgundian targes took. The targes in the image you linked to are probably a speculative reconstruction. Do you evidence for this? Judging by the materials I'd say; maces, warhammers, and axes of similar size should all cost about the same. Now, regarding on pollaxes, with the exemption of the traditional styles, a continental/english style of pollaxe wasn't accessible to a soldier who isn't a man-at-arms or of the knightly classes. That's a fair point. The pollaxe was, and is, usually thought of as a gentleman's weapon, and the axe-men mentioned in Scottish legislation came from the country's yeomanry, so perhaps a Lochaber axe or another similar weapon fits better. Using the shield in the left arm to use a weapon double-handed it's possible, but all the examples of it are always with shields that isn't too large: the exception being to the kite shield, but even this isn't especially large in the horizontal lines (where it covers your arm). When a kite shield is used in conjunction with a two handed weapon it isn't strapped to the arm, but rather held up by means of a strap around the neck. Unfortunately this is most likely the case. Spanish sources from the late XVth century and early XVIth century tend to show the pavisemen armed with darts (probably fletched javelins with "dove tail" points). 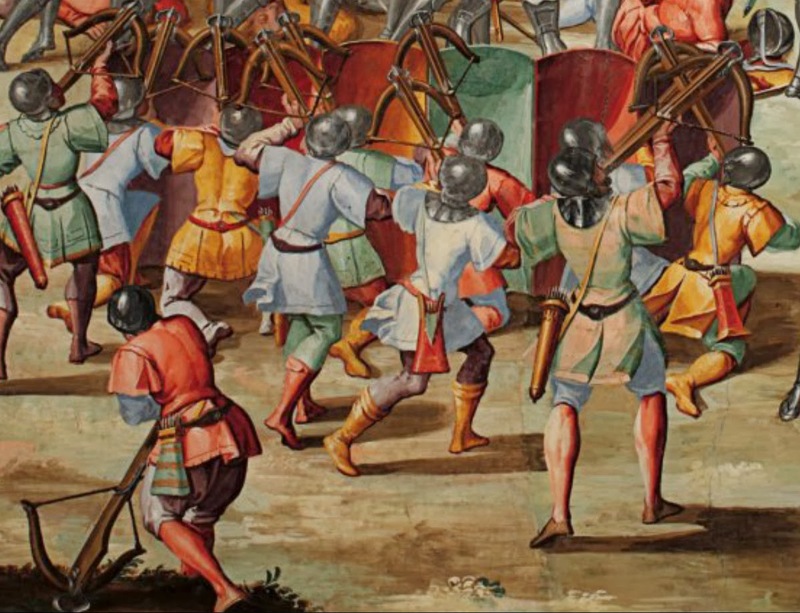 In Lope García de Salazar's "Bienandanzas e fortunas", XVth century combats between half a dozen and several dozen supporters of the low nobility families in northern Castille shows a tendency to crossbow combat from distance (like a Wild West shootout), and if the fighters got closer, pavisemen would throw darts. In some cases, hand to hand combat followed with spears, very rarely with swords. Sometimes, armoured cavalry would be present and also threw darts, to continue with spears or swords. Of course, while attacking or defending houses, ships and towers, a very frequent kind of combat, pavises came handy too. 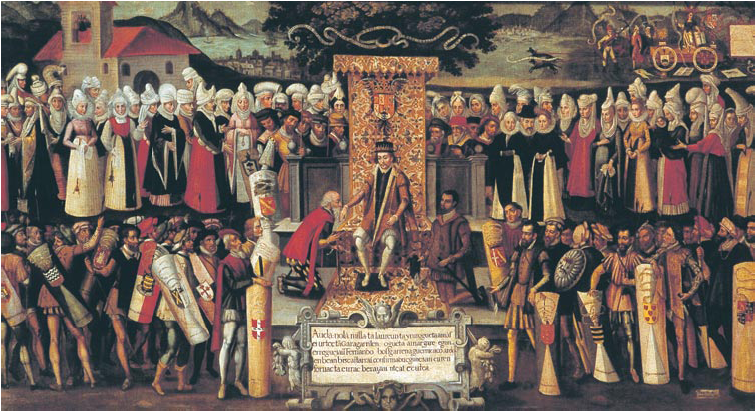 As bonus, some ceremonial pavises, early 1609 painting showing Ferdinand II fulfilling his feudal duties in 1476. The usage was as a mobile wall. 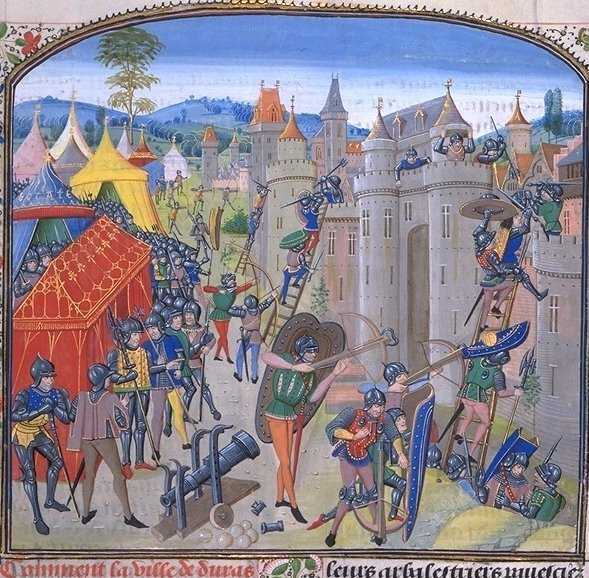 I would argue otherwise, but when I checked Heath's illustration that shows a burgundian pikemen with a buckler-like targe, he admits that there isn't any contemporary artistic source showing the pikemen carrying shields (according to his speculations, probably because they weren't popular), so his construction is enterily speculative too. I had a link showing the prices of stuff in Medieval England, but I lost it. In any case, materials isn't necessarily decisive regarding the costs of weapons and armor, since the labor and technique involved would count more. Maces, at least those I'm aware, were all flanged; the morningstars, however, were peasant's weapon in Bohemia; according to George Gush in his "Renaissance Armies", to swiss patterns, the Lucerne Hammer was a levy's weapon due to its simplicity. Even one-handed axes could be separated into lower-classes' axes and nobility axes. I recently found a 1520's painting century showing a German noblemen with a Horseman's axe (first file below). Complexity would increase the price, since the arms-smith would take a whole lot of time and tecninique to do a more elaborate weapon than a simple one. The result is that poorer soldiers couldn't afford weapons that were too complex or were designed for a special social class. I never saw, neither in illustrations nor in written evidence, poorer soldiers using maces, at least not what the Portuguese would call as "Maça-de-armas" (or mace-of-arms). However, it should be noticed that we have evidence for the English longbowmen having, besides the arming swords and longsword; hatchets, mauls and battle-axes "hanging at their waists"; according to the Sire de St. Remy, ocular testimony at Agincourt. Another source also adds "becs-de-faucon" to the list of weapons. Source: Heath, Ian. Armies of Middle Ages vol. 1. pp. 97. Ergo sum: even if we don't have records about their prices, the fact they weren't required as part of basic soldier equipment and they were not shown in chronicles or artistic evidence support the thesis they weren't acessible to lower class' soldiers. This is perhaps an unrelated question but, some of the crossbowmen in Castile or Aragon actually carried personal pavises to use them as cover while shooting? I just know of the Portuguese, so I'm not inclined to do generalizations before evidence supports it. 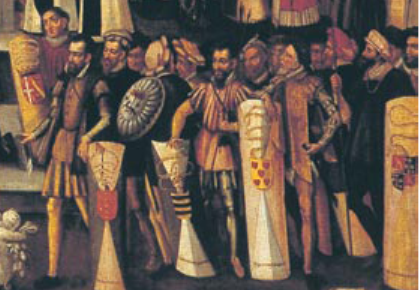 Besteiros do Conto had their own shields (If I remember correctly, all of them had one), but the Castillian Ordinance 1385 (file below) doesn't oblige the arrayed soldier to afford either armor neither pavise. Perhaps they did that because they often employed pavisiers to protect the crossbowmen, but that's just my opinion. 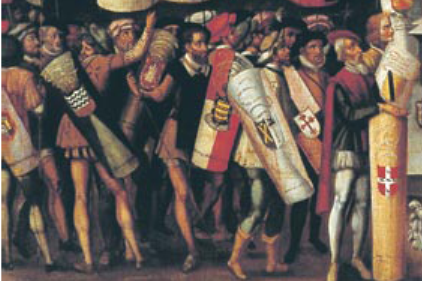 The people represented carrying the pavises were the noblemen themselves? Was that some sort of local traditional cerimony? This is the very first time I see a description of post-Hussistism formation of Bohemians. I find interesting they put the shields as cover to their static formation. The polearms, although it resembles of the swedish "sword-staff" is perhaps an Ahlspiess. I don't know of any source mentioning Castilian crosbowmen with pavises. Seems that they depended from spearmen-pavisiers to do so. Seems that it was a way to show their heraldic arms. Or maybe it was made up by the painter to show the heraldry. But in the early XVIth century there are mentions to decorative heraldic pavises, and in the North, there was still custom to go well clothed and armed (crossbows and swords for sure) to the Sunday mass, and leave the weapons in the porch. A show of status, so a big painted pavise would fit for the purpose too.